Greg Nicotero, an award-winning executive producer, director, and make-up special effects creator on The Walking Dead has come on board, with his company KNB EFX, to create the new Spawn design for the upcoming Todd McFarlane/ Blumhouse film. Nicotero was first reported to be attached to the project earlier this summer, but it is now official. McFarlane and Nicotero recently discussed their excitement to work together and take another swing at the Spawn franchise. Todd McFarlane, Greg Nicotero, and KNB EFX Group, worked together on the 1997 Spawn movie, which hasn't aged very well in the last 20-plus years. While the movie itself wasn't anything that great, the special effects and makeup were still pretty awesome. 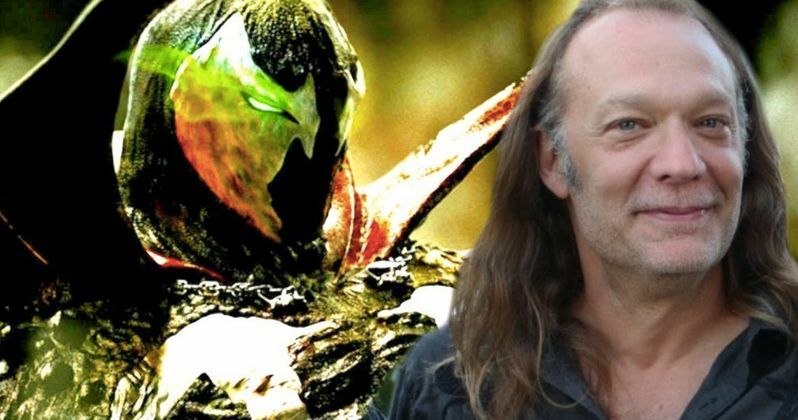 Nicotero is back for the new Spawn reboot and McFarlane is happy to be working with him again. McFarlane had this to say about working with Nicotero again. "I'm a long-time fan of Greg's work and the projects his company, KNB have done throughout the years. Working with him once again, to re-invent the Spawn look so it will match the supernatural theme in the movie, is going to be a fun process." Greg Nicotero currently works as an executive producer, special make-up effects supervisor, and primary director on the AMC TV series The Walking Dead and Fear the Walking Dead. Todd McFarlane and Blumhouse have kept pretty quiet about the specifics of the Spawn reboot, but they have said that it will be dark, which is something that has Nicotero excited. He had nothing but compliments for McFarlane and the Spawn franchise in a new interview. Nicotero explains. This year, Todd McFarlane has announced an ensemble of award winning talent that has signed on to the Spawn reboot cast. Academy Award and Golden Globe winner Jamie Foxx has been cast as Spawn and Academy Award nominee Jeremy Renner has been tapped to play Twitch. This newest adaptation, which is a gritty, R-rated reimagining marks McFarlane's film directorial debut. McFarlane is partnering with Jason Blum and Blumhouse Productions, the producing force behind recent hits Get Out and Split and The Purge franchise, to develop a feature film around the Spawn comic character created by McFarlane. As for people wondering if the Spawn reboot will resemble the first film, Todd McFarlane says that the new movie will have a completely different look. McFarlane and Greg Nicotero have been collaborating on the new look and feel of the reboot for the last several months and Nicotero reveals that the Spawn creator wants to take fans down a different path than what is currently being shown in superhero movies. Nicotero also says that the new movie will be taking the character back to its roots, which sounds very exciting. The Spawn reboot is currently in pre-production at Blumhouse, and is set to begin filming early next year.